Click here to find design templates and easy-to-use planting plans in this brochure by the Federation of Vermont Lakes and Ponds (FOVLAP). The ideas will help lakeshore owners protect the lake water quality while improving their property. A new state law requires changes to how trash and recycling are handled in Morgan effective July 1, 2015. Click here to see the new Morgan ordinance implementing the law’s requirements. Effective July 1, 2014, the Vermont Legislature passed the Shoreland Protection Act (Chapter 49A of Title 10, §1441 et seq. ), which regulates shoreland development within 250 feet of a lake’s mean water level for all lakes greater than 10 acres in size. The intent of the Act is to prevent degradation of water quality in lakes, preserve habitat and natural stability of shorelines, and maintain the economic benefits of lakes and their shorelands. The Act seeks to balance good shoreland management and shoreland development. Most of us take Seymour’s lake level for granted and in many ways this is understandable. Most of us are here only for the summer and often for short periods and the variation in lake level is not as great as other times. We put out our docks, swim, boat and enjoy the wonderful water of our lake. But lake level is important, not only for Seymour but also for other lakes in the county, all of whom share some of the same issues. Prior to 1887, there was no outlet structure impeding water exiting the lake. Lake level rose and fell according to the ability of the outlet stream to handle the inflow variations due to precipitation, snow melt, drought, etc. It is interesting to note that the average lake level then was a good deal lower than it is today. There were actually two or three tiny islands around the lake probably in the locations where we now see warning buoys. In 1887 the first outlet dam was constructed as a means to allow the local power company to better control flow to the various hydro power stations located downstream on the Clyde River which is where Seymour’s water eventually ends up. This original dam was replaced by the utility in 1928 followed by expansion of the capacity of the channel leading to the new dam from the lake proper. During the ensuing years leading up to 1951, property development around the lake increased. At the same time it became evident that the utility was using the lake excessively as a storage and drawdown tool for the benefit of their downstream hydro operations. This resulted in wild fluctuations in lake water levels much to the detriment of the lake proper as well as to various properties surrounding the lake. Finally, a group of concerned citizens took the issue to the Vermont Legislature which in 1951 passed a bill instructing the Vermont Public Service Commission to establish a set of low and high level benchmarks within whose 14 inch range the controlling entity would be required to stay within. The utility appealed this edict to the Vermont Supreme Court, which in 1952 upheld the new law. From 1952 until around 2004, the utility, as the controlling entity, dutifully followed the law, and made every effort to maintain the lake within the mandated range. Typically water moves downstream from a dam by flowing over a portion of the top of the dam called the spillway. The utility recognized that Seymour’s spillway capacity was inadequate to handle certain high incoming flows especially during the spring ice breakup period. This would result in water being backed up into the lake, thus resulting in excessive lake level increases. To mitigate this problem the utility, prior to 2004, made use of a 5 foot discharge gate which allowed the utility, when lake inflow was excessive, to better match the outflow with the lake inflow. Typically in the late fall, the utility would lower the lake level to near the allowed low limit in anticipation of the high springtime flows. This fall drawdown is a standard practice in surrounding States and Canada, and indeed is still practiced in several lakes in Vermont. However, the Vermont Agency of Natural Resources is anathema to this management practice and doesn’t presently allow it for Seymour Lake. Around 2002, the Federal license to operate the several hydro dams owned by Citizens Utilities along the Clyde River was about to expire, and required renewal. Because Seymour’s dam was owned by Citizens Utilities and had been used to augment flows to the Clyde dams, it was included in the relicensing process. Included in the relicensing process was the requirement that the 1928 dam be replaced. That structure had outlived its 75 year life expectancy, was leaking, and perhaps posed certain public safety concerns. A new dam was therefore designed and constructed and went into use in 2004. Relicensing requires that a Water Quality Certificate be obtained from the State. This was obtained in 2002, and in it were several stipulations pertaining to the Seymour Dam. Importantly, one of these stipulations was that the use of the discharge gate (installed with the new dam) to augment discharge flows was not to be allowed except with permission from the Vermont Agency of Natural Resources, which has not granted its permission since 2004. This is the reason why springtime lake levels since 2004 have been excessively high, which have resulted in shoreline erosion, property damage, and may be having an adverse affect on lake quality. 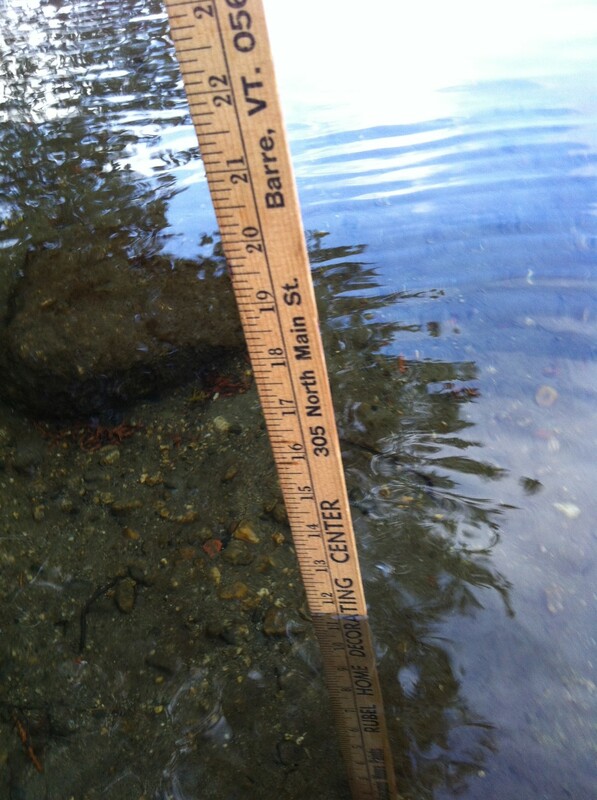 On May 1, 2015, as seen in the photo below the water level was just shy of 12 inches above the high pin.